B: AH2102N B-Celtic Bronze Sword This early Celtic style long sword is cast in solid bronze. Overall Length: 36 1/4 Blade: 30, Weight: 5 lb 10.5 oz, Edge: Blunt, P.O.B. : 8 1/4, Thickness: 9.5 mm - 8 mm, Width: 35.4 mm - 72.8 mm,Grip Length: 3 3/4"
C: AH2101N C-Bronze Antennae Sword This cast-bronze blade is based on an original Celtic bronze sword found in the river Witham, England. Bronze was a common sword making metal of the ancient world. This blade closely resembles others found on the continent, leaving researchers to believe it was brought or traded across the channel to the British Isles. Bronze swords were typically alloyed with 10-12% tin to make the sword stronger, but not so much as to be brittle. The blade edges were pounded to harden them. In battle bronze swords would commonly bend as opposed to breaking, and warriors could, in a moment of respite, bend them back. Historically the bronze swords have survived the ravages of time far better than iron and steel swords, and many examples exist in museums and collections that are in excellent condition. The unsharpened blade of this sword has had its hilt built around it and secured with copper rivets. Though functional to bronze age standards, this item is not being listed as battle-ready due to the inferiority of bronze weapons in comparison to steel. Bronze Age Bronze Age swords appear from around the 17th century BC, in the Black Sea region and the Aegean, evolving out of the dagger. They are replaced by the Iron Age sword during the early part of the 1st millennium BC. From an early time the swords reach lengths in excess of 100 cm. 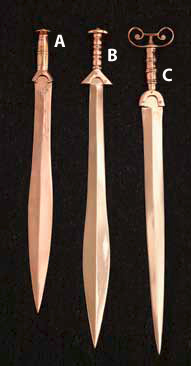 The technology to produce blades of such lengths appears to have been developed in the Aegean, using alloys of copper and tin or arsenic, around 1700 BC. Typical Bronze Age swords had lengths of roughly between 60 and 80 cm, while weapons significantly shorter than 60 cm also continued to be made, but are variously categorized as "short swords" or as daggers. Before 1400 BC or so, swords remain mostly limited to the Aegean and southeastern Europe, but they become more widespread in the final centuries of the 2nd millennium, to Central Europe and Britain, to the Near East, Central Asia, Northern India and to China. A: AH2103N A-Celtic Bronze Sword & B: AH2102N B-Celtic Bronze Sword; A typical variant for European swords is the leaf shaped blade, which was most common in North-West Europe at the end of the Bronze Age, on the British Isles in particular. The carp's tongue sword is a type of bronze sword that was common to Western Europe during ca. the 9th to 8th centuries BC. The blade of the carp's tongue sword was wide and parallel for most of its length but the final third narrowed into a thin tip intended for thrusting. The design was probably developed in north western France and combined the broad blade useful for slashing with a thinner, elongated tip suitable for thrusting. Its advantages saw its adoption across Atlantic Europe. In Britain, the metalwork in the south east derived its name from this sword: the Carp's Tongue complex. Notable examples of this type were part of the Isleham Hoard. This page was last modified on 21 April 2014, at 18:44.